By adjusting the power mode settings our advanced algorithms will predict how much you will save based on past PC usage and statistical data. Every time LocalCooling saves power by either turning of your screen, putting your hard drive to sleep when not used or shutting down your PC when you are away your savings stats will start to grow. 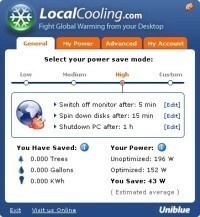 Download LocalCooling today and optimize your PC's energy efficiency in minutes.